Change management is a key discipline that turns complexity into progress. AllChange can effectively control and document change together with its consequential impact. With AllChange, change management becomes a corporate resource. Its simple sophistication opens up the potential for everyone throughout the organization to contribute positively to the change process. The integrated change and configuration item management allows AllChange to control changes and to automatically build relationships with the items that are changed. This provides full audit trails and traceability of items as well as progress through the change process. The flexible nature of AllChange ensures that you can tailor your templates and forms to reflect the information that your business needs to manage change across all different change categories e.g. testing fault reports, problems, requirements and enhancement requests. Changes can be assigned on a team or individual basis and progress can be monitored with automated emails, ad-hoc queries or reporting facilities. AllChange ensures that you have the information you need to make the decisions that drive change through your organization on a day-to-day basis. 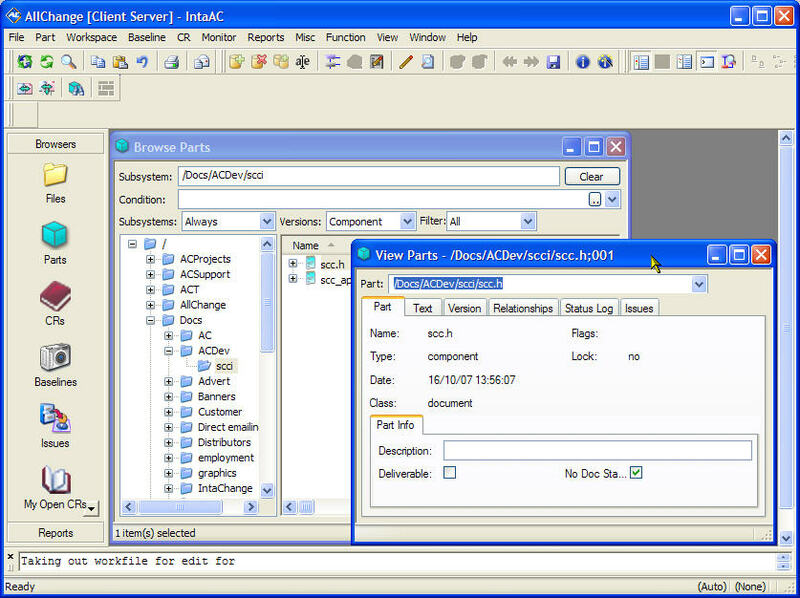 The Parts browser gives hierarchical views of all configuration items and the relationships between them. The Parts viewer drills down to detailed information about each item.